Hawaii Gearing Up for APEC 2011 Goody Bags & More! Do you have your tickets for Asia-Pacific Economic Cooperation summit (APEC) in Hawaii yet? The State of Hawaii economic development and tourism teams are over the moon about this amazing opportunity and have been aggressively courting all the attending countries. Look for lots of care and hometown pride from both the President and First Lady. APEC United States 2011 will be a series of meetings of the 21 Asia-Pacific Economic Cooperation member economies held around the United States in 2011. It will culminate in the 19th APEC Economic Leaders’ Meeting held at the Hawaii Convention Center in Honolulu Hawaii from November 12–13, 2011. The United States last hosted an APEC summit at the 1993 summit. President Obama and First Lady Michelle Obama will host the other leaders and spouses. One of the opportunities is to showcase the products of Hawaii with an incredible “Gift Bag”. Here is the RFP. The APEC 2011 Hawaii Host Committee is seeking qualified vendors to supply and showcase their products or services for distribution in the form of hospitality gifts to 11,000 government officials, business leaders and global media during the Asia-Pacific Economic Cooperation (APEC) Leaders’ Week events. A Request for Qualifications (RFQ) was issued by the Host Committee on July 12, 2011. Gift certificates for goods or services ($50 minimum retail value amount, with no purchase required). Items are to be no larger than 22”L x 18”H x 3”D (Size of Hospitality Gift Bag). The selection of suppliers will be based on overall bids received and how each item contributes to the aggregate of products to be inserted into hospitality gift bags. Suppliers must be able to supply a minimum quantity of 500 items to be considered. Interested suppliers can obtain a copy of the RFQ by emailing the APEC 2011 Hawaii Host Committee at rfq@apec2011hawaii.com. Please indicate the company name, contact name, contact phone, facsimile, address and email address. The deadline for RFQ submissions is July 29, 2011 at 4:00 p.m., with supplier selections being announced on August 15, 2011. 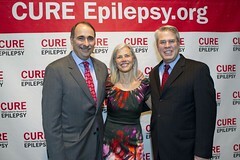 David Axelrod: Epilepsy "Terrorism of Brain"
David and Susan Axelrod dazzled the city by the bay with the launch of the CURE Epilepsy 1st Annual West Coast Benefit in San Francisco, CA. 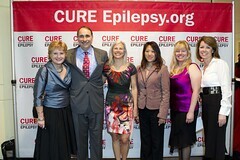 Evelyn Nussenbaum and Fred Vogelstein co-chaired the dinner with in-laws, John and Barbara Vogelstein, and Susan Axelrod. 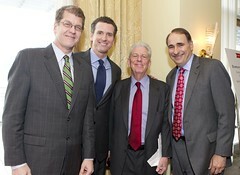 San Francisco political superstars Lt. Gov. 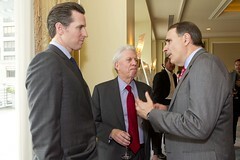 Gavin Newsom and Willie Brown, joined Susan and David Axelrod to raise awareness and funds to support epilepsy research. 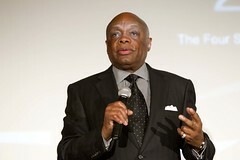 The omnipresent and forever mayor in many San Franciscans’ minds, Willie Brown, whipped the crowd into a giving frenzy Phil Donahue style, raising money paddle by paddle to support the “Fund a Need” grant program. 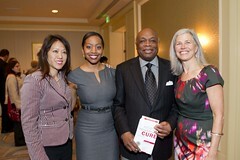 Guests included San Francisco County Supervisor Malia Cohen, SF lawyer Rich Guggenhime, Men’s Health Magazine’s Andrew Kramer with his beautiful wife, Caryn and Google’s David and Marimo Drummond. 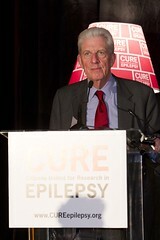 The event also highlighted the groundbreaking work of Bay Area scientists who have received CURE grants to continue their research. 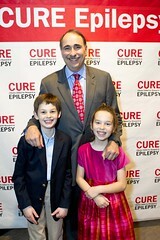 David Axelrod told the audience that the two most amazing women he will ever know are his daughter, Lauren, and his wife Susan, an evangelical epilepsy advocate. 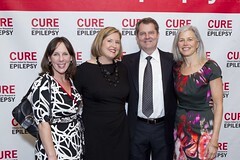 He also described the amazing families who he has met through their 30 year journey with epilepsy describing one family friend who votes Republican and watches Bill O’Reilly every night: not important as this is a disease that transcends politics and ideology. 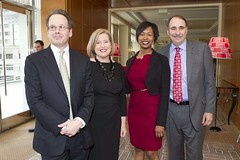 New Washington friends and old Chicago pals gathered at The Jefferson Hotel to honor Susan Sher. Sher came to Washington with the Obamas serving first in the White House Counsel’s office and for the last 18 months as the First Lady’s Chief of Staff. 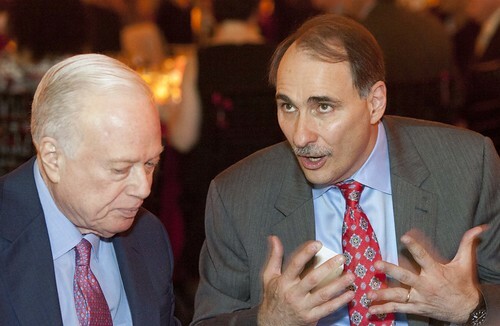 Connie Milstein, Hilary Rosen and Tammy Haddad hosted the luncheon, which included David Axelrod, Kevin Sheekey, Julianna Smoot and Patrick Gaspard. Israeli Ambassador Michael Oren (with his wife, Sally) saluted Sher’s West Orange, New Jersey roots as the other jersey girls, Anita Dunn and Hilary Rosen, proudly cheered him on. David Axelrod, who leaves Washington at the end of the month, praised Sher for her always-cool leadership and integrity. Axelrod said he was already making Chicago plans with Sher and Julianna Smoot, the White House Social Secretary, who announced this week she would go back to Chicago as Deputy Campaign Manager. Other guests included Milstein’s husband, JC de La Haye Saint Hilarie, Linda Douglass, Rabbi David Saperstein, Anne Fleming, Alan Solow, Susan Davies, Danielle Grey, Maude Baggetto, Danielle Borrin, and Holly Page. With today’s historic shift to a Republican controlled House of Representatives, here is the latest Wikipedia list of tenure of the “Speaker of the House” over history. Imagine what Washington was like with the reign of Sam Rayburn who held the Speakers chair for over 17 years. He was followed by Tip O’Neill with 9 years and 350 days, John McCormack with 8 years and 344 days and Dennis Hassert with 7 years and 359 day. Nancy Pelosi beat out Newt Gingrich by only 2 days with Pelsosi serving 3 years and 363 days. The 85-year old Mayflower Renaissance DC hotel has had it’s share of notable guests (remember Monica Lewinsky and Eliot Spitzer?). The list got longer Saturday night with more glamorous names like Ewan McGregor, Ashley Judd, Dennis Quaid, Tory Burch, Kim Kardashian, and Bobby Flay. The Grand Ballroom was instantly transformed for the annual White House Correspondents’ Association Dinner after party hosted by Capitol File magazine, Renaissance Hotels and Bing. Here’s a video provided by the Mayflower Renaissance DC about the makeover. The White House Correspondents’ Dinner could potentially get really uncomfortable next weekend at the MSNBC tables, particularly if hosts Keith Olbermann and Donny Deutsch are in the mix of guests and stars. Olbermann showed up to WHCA’s dinner last year — will he come again this year? 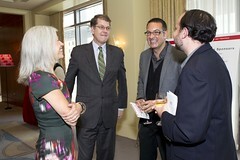 Media insiders want to know: Will Griffin split the pair up, or will Olbermann refuse to sit with Deutsch if he attends? And who decides the seating chart? “Is Olbermann controlling the strings?” a media rep asked. This week we’re compiling an Awkward Seating Chart for media folks around town. If you have input on potentially uncomfortable pairings, tell us about it. E-mail us at fishbowldc@mediabistro.com. Deutsch is off the air this week, at least in part, we’re hearing, because Olbermann was furious about Deutsch floating a photograph of him while speaking of the Tea Partiers and “America the Angry.” President Phil Griffin was also reportedly angry and said as much to Deutsch and his producer, Gresham Striegel, who’s also off for the rest of the week. [picappgallerysingle id=”4753149″]It’s that time of year again when the Washington press corps fights over Hollywood stars as dates for the annual White House Correspondents’ Association dinner. This year’s May 1 event is already turning into a who’s who from the Hollywood Walk of Fame. Politicians and Washingtonians have almost become a sidebar at the annual media event that features a funny monologue by the president and a real comic. This year it’s Jay Leno. Stars expected include Alec Baldwin, Ewan McGregor, Jimmy Fallon, Jon Bon Jovi, Judd Apatow, Tracy Morgan, Mary J. Blige, Steven Spielberg, Michael Douglas, John Cusack, Scarlett Johansson, Jessica Alba, Julianna Margulies, and Jeremy Piven. And it’s not just the press “prom” that’s a big show. There are several major parties built around the event, some before, some after, and TV talker John McLaughlin’s is held the next day, on Sunday. To get a feel for the types of parties, below is the press release description of the one affair virtually everybody will trek to after the official event is over Saturday night. 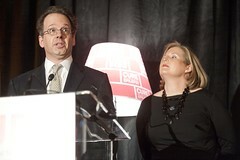 It’s held by Jason Binn’s Capitol File and this year co-hosted by CNN’s Wolf Blitzer and celebrity chef Bobby Flay. We don’t know if Flay’s going to do a throwdown challenge to Blitzer. Niche Media CEO Jason Binn and Capitol File magazine’s John Colabelli and Sarah Schaffer are hosting their Fifth Annual Afterparty with special guests including Wolf Blitzer of CNN’s The Situation Room. Bobby Flay, Chef and TV personality will be adding his unique flavor to cocktails and hors d’oeuvres and music will be handled by world-renowned DJ Cassidy. The WHCD after party will take place at the The Mayflower Renaissance Hotel starting at 10 pm. 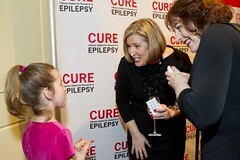 Last year’s event was held at the Corcoran Gallery. Thursday morning: L’Aquila July 9, 2009 Gordon is off for his first breakfast meeting early, but I get an extra hour as we wait for the other spouses to arrive at the earthquake-hit town of L’Aquila. I did not know what to expect from the police barracks allocated for our accommodation but actually it is all very comfortable and all mod cons in full working order. All apart from one incident with a stuck lift for the events team (and a rapid response from the super efficient Italian staff), which has motivated us to be super-healthy and use the stairs. Once the rest of the spouses have arrived we are treated to coffee and pastries. Everyone looks well-rested after a good night’s sleep. We are all assigned to buses for our journey to the area worst hit by the earthquake in April – I’m with my good friend Margarita Zavala from Mexico who remembers her country’s own devastating earthquake of 1985 We travel to the Piazza Duomo in the old town of L’Aquila. The full scale of the devastation really hits you when you see such beautiful buildings full of cracks and surrounded by crumbling stones. A glimpse inside a church revealed nothing but piles of rubble waiting to be sifted through during the coming months, to enable the restoration. We are then taken to the centre of the devastation where so many lost their lives and everybody lost their homes. We are taken back to the G8 compound and run into Gordon and his team walking between meetings. We take the chance to make a call home and speak to our youngest son. Gordon goes off to his next session and now I head off to rejoin the spouses for a nice Italian lunch.